El Rancho de Lalo has been in Brixton Village for as long as we can remember and, despite the area’s recent renaissance in smart modern eateries, its simple approach to Colombian food still seems to be holding its own. Located on the Coldharbour Lane side of the Village, the restaurant’s exterior still manages to stand out with a tidy awning, dark wooden detail, and half a dozen tables outside. The interior is simply furnished with an open kitchen displaying hanging sausages and a couple of chefs hard at work. The service was friendly, came with a smile and, although not advertised on the menu, provided us with a couple of Corona beers served with lemon, and a surprisingly refreshing Kiwi juice. The menu was short with similar looking dishes throughout. As with other South American Cuisines Colombian food is relatively simple mostly consisting of meat, rice, and beans. A couple of us ordered the Colombian National dish, the £10 Bandeja Paisa, which was more of a platter than a dish, consisting of a large Colombian Sausage, thinly cut steak, crispy pork belly, kidney beans in a dark sauce, a mound of rice topped with a fried egg, corn bread, avocado, salad and a slice of plantain. All in all it was pretty delicious. The sausage was beautifully spiced, the steak well cooked, the avocado perfectly ripe and the unlikely presence of an egg somehow seemed to work. The other member of our party went for the £10 pork that came with similar trimmings plus a potato and was, by all reports, pretty tasty. As is probably clear from the sheer quantity of components, the portions were huge, and could quite easily have been shared. Dessert was super sweet figs, a semi solid serving of caramel and a white Colombian Cheese. The saltiness of the cheese worked well with the sweetness of the figs and the caramel bound the two together perfectly. 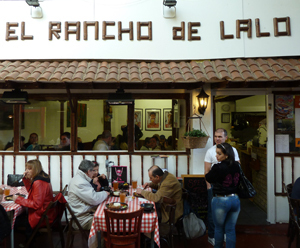 El Rancho de Lalo is a simple restaurant serving simple, well executed food. If you’re a big fan of meat, looking to fill yourself up, and not willing to spend more than a tenner when doing so, this is probably the place for you.